Had difficulty deciding whether to tamper with the whimsical excitement of encountering unexpected illuminated art in vacant storefronts. To tour or not to tour? But the Mister gamely rushed home in his reverse-commute so we could arrive at the 5:30 start time for the opening walk of Cut and Paste, a continuation of Public Art San Antonio’s X Marks the Art series of public art installations. And then we waited. And waited. We considered just walking on our own, but, given the number of people at the weeknight gathering competing with Mardi Gras celebrations, bailing out seemed rude. In defense of PASA, this probably was the planned “reception” time, we just would have preferred to have not rushed and, instead, to have arrived at 6:15. Finally, 45 minutes later, the art walk got under way. Rather than rely on random chance encounters, we were happy we waited for the walk because of the opportunity to hear several of the artists explain the rationale behind their work. As curator, Cruz Ortiz did a spectacular job of assembling a dynamic group of installations. Visit the website, and follow the X’s around downtown. The displays will be up through May. Or go on the next after-work tour, which actually is billed as lasting an hour so should begin right at 5:30 p.m. on Tuesday, March 12, on the riverside plaza, Argo Plaza, at 175 East Houston Street. 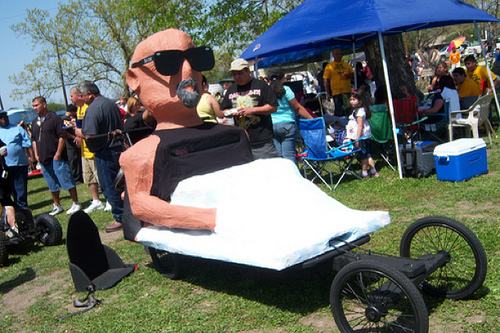 An event that appears as though it should not be missed next year, like I did this year, has to be the Dignowity Hill Pushcart Derby, which Rina Moreno and Cruz Ortiz originated as a creative contribution to Contemporary Art Month. If you failed to attend as well, click here to read the San Antonio Express-News’ coverage. But, what convinced me to find out more was Jennifer Herrera’s photograph on NowCast San Antonio. Not sure whether it was the shades or the goatee that compelled me to explore deeper, and, fortunately, someone has posted video footage capturing the carts careening across the finish line. NOWCastSA is a grassroots project of Community Info NOW (formerly AACIS) and is funded in part by a grant from the John S. and James L. Knight Foundation, administered by the San Antonio Area Foundation.… NOWCastSA provides an interactive online communications portal for sharing neighborhood news – from neighborhood meetings and celebrations to disaster preparedness and volunteer opportunities, NOWCastSA focuses on the events, issues, and concerns that matter most to the neighborhood. Working hands-on with citizen journalists of all ages, the NOWCastSA team helps build new bridges for neighbor-to-neighbor communications.